Google UK urges you, in its latest advert, to “be more at home” with its newest hands-free smart speaker Google Home, powered by Google Assistant. “Home is a special place. Full of unique moments. Moments of wonder. 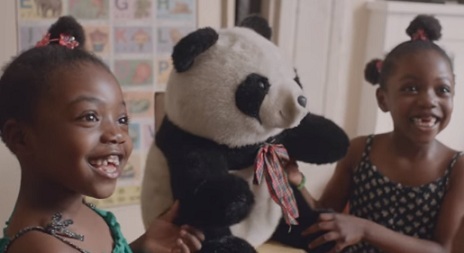 Special moments, like this one.” – says the voiceover in the 60-second spot, capturing special moments in various families’ homes, and referring to a tea party organized by two little girls, where the special guest is a panda teddy bear. “Right now, happening in front of you right now”, continues the voiceover, while the girls’ father is shown sitting on the couch, near them, but with his eyes glued to the tablet. As the kids clink their small cuppas, the man raises his eyes and, when the voiceover says “If only there was something to help keep us in the moment” and urges him to give it a go and join them, he gets the idea to ask Google Home to provide information on panda bears and then to play music, namely the song “Spinning All Around” by Noonday Underground. The spot continues with scenes from other homes, where Google Home is used for both informative and entertainment purposes, a mother asking Google how many Moons Mars have and a woman with her boyfriend asking Google to play Stranger Things from Netflix on the TV. “Be more at home Google Home” – is the final onscreen line. Google highlights that Google Home can distinguish, with support for multiple users, your voice from others in your home so you get a more personalized experience. You can ask it questions and tell it to do things by starting with “Ok Google”.